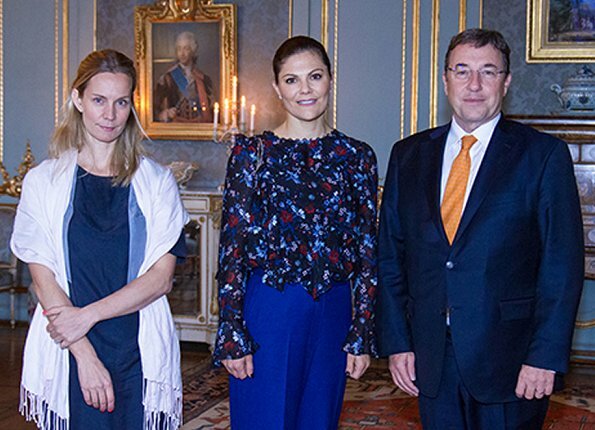 Crown Princess Victoria received UNDP Administrator Achim Steiner and UNDP Sweden representative Caroline Aberg at Stockholm Royal Palace and attended a meeting relating to "Sustainable Development Goals" with them. UNDP (UN Development Programme) works in about 170 countries and regions for the purpose of helping annihilation of poverty and alleviation of inequalities and ostracization. Ich mag den Schnitt der Bluse und die Farbe der Hose. Sehr nett. Looks very nice. Nice colours. I can tolerate the blouse, it can maybe be worn somewhat successfully with a casual pair of white trousers. But I cannot understand what made Victoria tug in the blouse. And most of all, I cannot fathom why someone would make her wear those hideous electric blue trousers that look like an absolute nightmare, combining the baggy 80s style cut with the loud neon colours of the early 90s. Those are so bad, I cannot even... Arrghh. She has dressed so strikingly badly lately. One miss after the other. It´s really sad because she can look so radiantly beautiful. But this experimental retro-edgy phase that her stylists put her through needs to stop ASAP. At least she´ll look normal on her upcoming nature walk. Or at least one would hope. And please Victoria, don´t become a slave to H&M. I agree, Vanessa. One horror after the other lately. Strange. I'm not a great fan of the blouse but she definitely should not have tucked It in. And she should have worn slim fitting black pants, not those awful wide bright blue ones. I agree @Vanessa C that her recent style choices are not good. Don´t like this one. 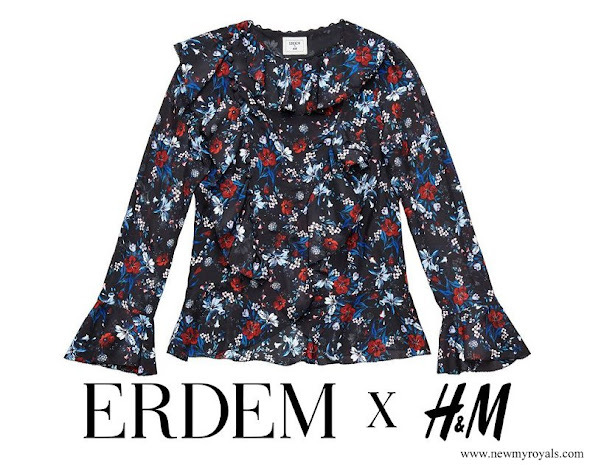 I always thought I am a "flower girl", but it seems these flower pattern clothes today are seldom my piece of cake. They look too busy or ugly colors. Trousers here are just horrible.